Click here for direct link to audio Episode #15. Surely you’ve seen the statues. The Tauroctony. 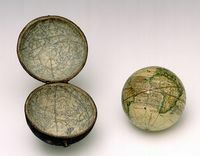 This one is from the British Museum. A good-looking guy with longish hair, wearing a short tunic, a flowing cape, and a Phrygian cap. He looks nice enough, but he’s plunging a dagger into the neck of a bull that appears to have been minding his own business! My word! What’s up with that? And then you’ve got this little dog and the scorpion and the crab and the snake all hanging out with the bull. Who can figure that out? Well, as archaeology is a fairly young discipline, we’ve got some catching up to do. 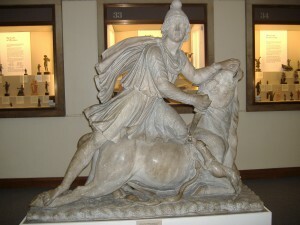 The deets about Mithraism are still being catalogued by our brothers & sisters “in the field”. To get a sense of the vastness of Mithraic worship, there are at least 190 known Mithraea around the Roman world and a mere 1/10th of them have been excavated. Fifteen Mithraea have been located beneath Catholic churches in Rome. But there’s a lot that we may never know or understand, no matter how long or hard archaeologists work. A true “mystery religion”, believers were bound to secrecy on pain of death, so no written evidence exists at this time to describe their rituals and practices. 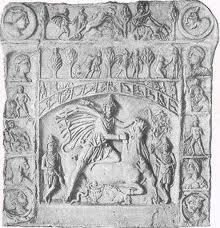 One Mithraic practice we are certain of is that on occasion a real bull was slaughtered above the vaulted underground temple site and the blood of the animal showered down over a select individual. Egads! Let me outta here! We also know that it was primarily a religion of the Roman military. Over the centuries, Mithraism worked its way up from the lower classes into the Roman elite. Mithraism took hold in Imperial Rome around the 2nd century CE after the Emperor Commodus was initiated into its mysteries. Freed slaves achieved wealth and status, and veterans of the military retired to Rome itself or some province of the empire and lived out their days practicing their religion. Ultimately, pagan religions were outlawed by Theodosius at the end of the 5th century and Mithraism died out. Enjoy today’s episode. Next week I detail some of the recent theories on the astronomy behind Mithraism. Homework for this week: read an encyclopedic entry for astronomy to get the basic concepts down before next week’s episode. Click here for direct link to audio Episode #13. It is important to note that the Roman Empire could not have existed without the free labor of those forced into slavery. The island of Delos was the hotspot for slave auctions. There, you could buy slaves from all over the empire to: keep your books on your farm in the country, take dictation in your consul meetings, tutor your first-born son, protect your house, fix your hair and make-up in the morning, manage your villa in Gaul, raise your children, cook the day’s meal, beat & torture your other slaves when they got out of line, and remain so faithful that he kills himself when you die! Imagine—most of the people in Rome were slaves! 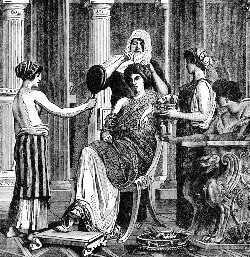 The worship of Isis by the Egyptian slaves of Rome became a bone of contention with the imperial government and their most important temple was destroyed a number of times over the centuries. Does slave-labor exist today? Something for our young people to think about. And can low-wages be considered a form of slavery? Aaahhh, the quest for the truth leads you down all kinds of roads! Back to the ancient world! Today’s podcast is the first in a five-part series on the pre-Christian religions of the ancient world. The Pantheon of Greek & Roman gods and goddesses lead the series with a look at the important devotional practices of the everyday citizen of Athens & Rome. Second in the series addresses the Eleusian mysteries concentrated around the worship of Demeter and Kore (her daughter, Persephone). The third in the series explores the military aspects of Mithraism and its early importance to the ordinary Roman soldier and its later importance to the political elite of Rome. Our fourth episode follows the establishment of Isis worship outside of Egypt, and in Rome and her provinces, in particular. The final episode in the series will feature the Cult of Dionysus and all the wild goings-on of the bacchanalia. Here is the FTD florist logo discussed in today’s podcast, which features Hermes/Mercury, the messenger god. 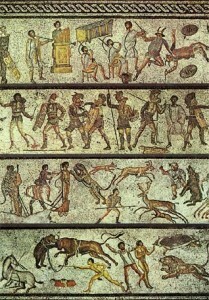 And a sad image of the revolting practice of animal slaughter for the pleasure of the Roman masses. “Bread & circuses” sums up how the Roman government provided food and entertainment to keep the Roman people off the streets and pacified. Why revolt when your stomach is full and you’ve had some fun down at the Coliseum?